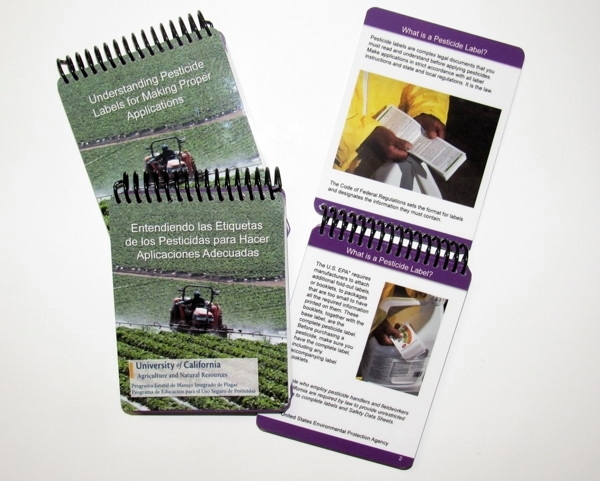 The UC Statewide Integrated Pest Management Program (UC IPM) put together a 26-page card set in English and Spanish on understanding pesticide labels. Intended for pesticide handlers, applicators, safety trainers, and pest control advisers (PCAs), the cards explain when to read the label, describe what kind of information can be found in each section of a pesticide label, and point out specific instruction areas so that applicators can apply pesticides safely and avoid illegal pesticide residues. Traces of pesticide residue are normal and even expected after pesticides are applied to food crops, but by the time produce is ready to be sold, purchased, and consumed, residues are usually far below the legal limit. In its latest report from 2013, the California Department of Pesticide Regulation (DPR) reported that there was little or no detectable pesticide residue in 97.8% of all California-grown produce. This demonstrates a strong pesticide regulation program and pesticide applicators that apply pesticides safely and legally. However, there have been instances in California where a pesticide not registered for a specific crop has been used unintentionally, resulting in illegal residues and eventually crop loss and destruction. The Environmental Protection Agency (EPA) sets tolerances for the maximum amount of pesticide residue that can legally be allowed to remain on or in food. DPR regularly monitors domestic and imported produce for pesticide residues and is considered the most extensive state residue-monitoring program in the nation. The primary way pesticide applicators can assure that they make proper applications and avoid illegal pesticide residues is to follow the pesticide label. UC IPM's new card set was developed from information in the upcoming third edition of The Safe and Effective Use of Pesticides as well as Lisa Blecker, UC IPM's Pesticide Safety Education Program coordinator. Bound with a spiral coil, this eye-catching instructional card set was designed for both English-speakers and when flipped over, for Spanish-speaking audiences as well. UC IPM also plans to release a new online course on preventing illegal pesticide residues sometime late fall. To download copies of the card set in English or in Spanish, see the UC IPM web site.